The Arctic is a fascinating place not just for polar scientists, but also for environmentalists and tourists. The sea ice there has become something of a ‘poster-child’ for climate change, being both an indicator of polar warming and a driver of it via mechanisms such as albedo feedback. However, the most that the average person sees of it are remotely-taken images showing the whole region with a vast expanse of white at the top of the globe – usually in the form of a video of it shrinking. What you can’t see from these images is just how varied and inhomogeneous the Arctic sea ice really is. Rather than a flat, white plane, a more detailed image would show the ridges, cracks, and ponds that are the true ice surface. Climate models also look at large-scale pieces of the Arctic. It takes a lot of computing power to study the whole Earth, so the globe is divided into large chunks to make it easier. In doing this, though, smaller scale features of the sea ice are not included. This creates errors, because often these features are actually very important to the physics of the ice. To fix this, some scientists model small-scale processes and derive expressions of their effects on their surroundings. This information is then given to climate models to improve their accuracy. In my PhD project, I am studying one of these small-scale processes that occurs beneath the sea ice rather than on top of it. Surface melt ponds form on top of the sea ice in the Arctic summer as the upper layers of the ice melts. They have their own effects on the region, such as significantly lowering the amount of incoming solar radiation that it reflects back into space. This surface water can also drain down through the ice and out of its base. Since it is relatively warm and fresh compared to the ocean, it then forms a pool of fresh water floating between the ice and the ocean. These pools beneath the ice are called ‘under-ice melt ponds,’ and they have some interesting impacts on the sea ice above them. 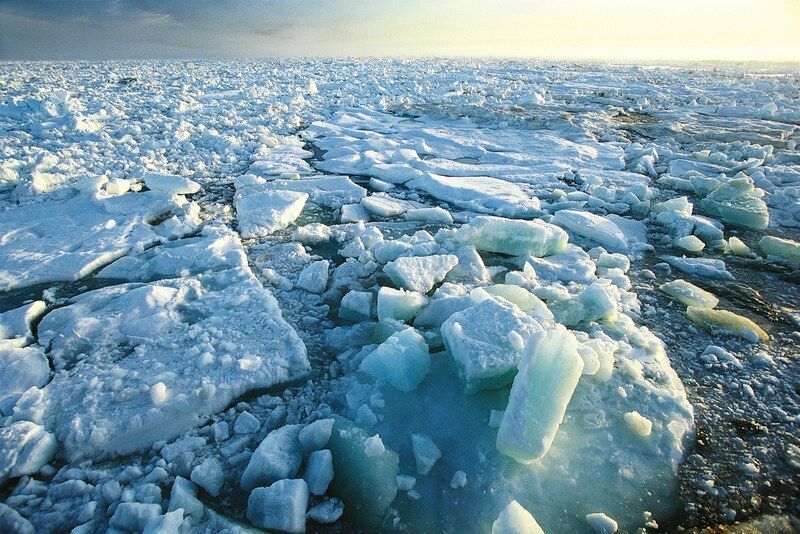 Normally, the ocean transfers heat to the base of the sea ice in the winter months, causing melting. Our model shows that under-ice melt ponds insulate the ice from the ocean. This means that under-ice melt ponds change the amount of melting at the base of the ice, and as a result they affect the mass-balance of the sea ice. At the end of all of our simulations, ice underlain by an under-ice melt pond is thicker than bare ice. The thinner the sea ice, however, the less growth occurs due to the pond. In the context of a warming Arctic, this could be a positive feedback cycle; as the pole warms, we expect to see thinner sea ice, and so maybe less ice growth will occur due to under-ice melt ponds in the refreezing season.This could be counteracted by an increase in average pond depth, leading to longer refreezing times. Pond salinity also plays a role in the evolution of an under-ice melt pond, with saltier ponds typically taking longer to freeze. Not only do under-ice melt ponds protect the ice that is already there, but they are the only way that significant amounts of new ice can form in the summer months. Ice sheets can form at the interface between the under-ice melt pond and the ocean, isolating the pond from the water below. These sheets are called false bottoms and they can grow to around 10 cm thick. False bottoms are not very permeable, so they prevent pollutants from leaving the pond (Eicken, H. 1994). For high pond salinities and deep initial pond depths, we find that the false bottom melts before the under-ice melt pond is able to completely refreeze. We are currently investigating the impact of under-ice melt ponds on the upper layer of the ocean beneath the sea ice. In changing the amount of basal melting, the amount of fresh melt-water entering the upper layer of the ocean from the ice will be different. This could have consequences for the properties of the oceanic mixed layer, the well-mixed region close to the surface of the ocean.